This vintage '50s leather clutch purse was purchased in Argentina. 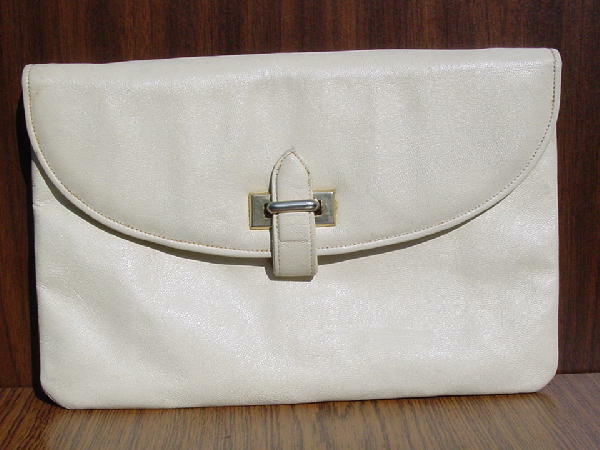 It's in a bone color and has an envelope styling with an upside down tab closure. You can attach a strap or chain if you don't wish to carry it as a clutch. It has a great black leather lining with 2 center compartments. The back one contains an interior fabric-lined zippered pocket, and the front section has a big open fabric-lined bone leather pocket. The front section also has 2 open bone leather pockets and a center little pocket to hold a tube of lipstick. There is a lipstick stain on the outside of the lipstick holder. After all these years, there is still a strong odor of leather in the compartments. It was used in a magazine photo shoot in South America with a wool Chanel shirt, a cream Gian Franco Ferre sweater, and a Givenchy logo scarf.